On 23 June 2016, the UK voted to leave the EU. As soon as the result became clear, sterling depreciated sharply and, since the vote, UK inflation has dramatically increased. How much of the rise in inflation is due to the referendum? 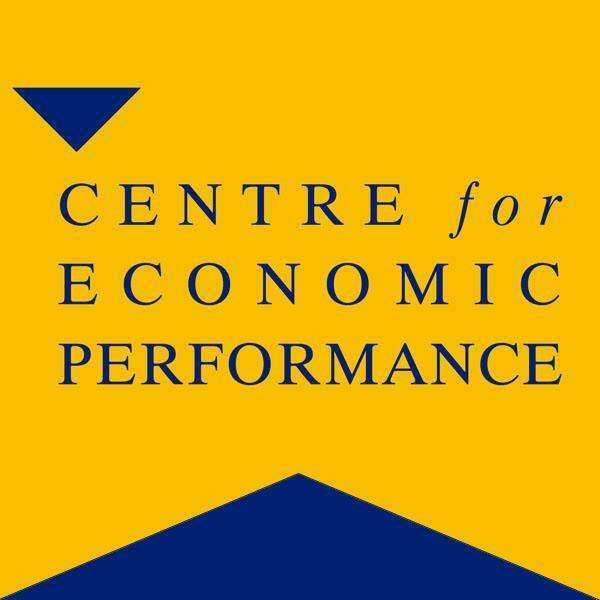 Holger Breinlich, Elsa Leromain, Dennis Novy, and Thomas Sampson, (LSE’s Centre for Economic Performance) find that the referendum result pushed up UK inflation by 1.7 percentage points. This amounts to an annual (and potentially permanent) cost of £404 for the average British household. UK households are thus already paying a high economic price for the vote to leave the European Union. Brexit is forecast to have substantive economic costs for the UK. 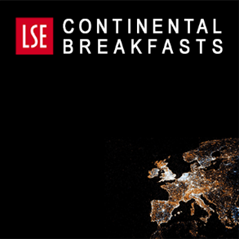 Most forecasts analyse long-run effects and are based on the assumption that economic barriers with the continent will rise once Brexit occurs (Aichele and Felbermayr, 2015; HM Treasury, 2016; Dhingra et al, 2017). But it will be many years before the long-run economic consequences of Brexit become clear. However, this does not mean it is too soon for the Brexit vote to be affecting the UK economy. Economic behaviour depends upon both the current state of the world and expectations about the future. The referendum increased uncertainty and led to a decline in the likely future openness of the UK to trade, investment and immigration with the EU. Consequently, financial markets downgraded their beliefs about the UK’s economic future, leading to the decline in sterling. Through this channel, concerns about the long-run effects of Brexit have already impacted the UK economy. In recent research (Breinlich, Leromain, Novy and Sampson 2017a), we do not forecast the potential effects of Brexit. Instead, we analyse the effects that have already materialized. We exploit the notion that the result of the referendum vote in June 2016 took most people (including financial markets) by surprise. As soon as the outcome became clear the pound depreciated sharply. 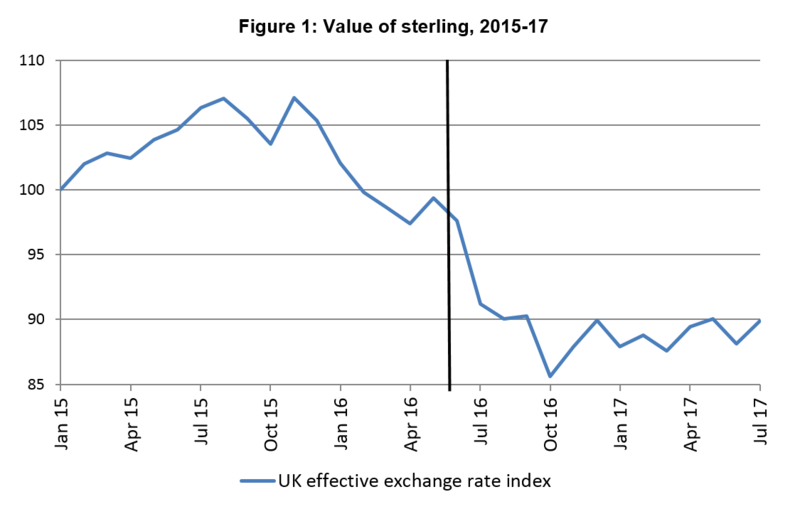 This decline persisted in subsequent months, with sterling still around 10 percent below its pre-referendum value by November 2017 as shown in Figure 1. Source: CEP calculations. Notes: Import weighted effective exchange rate calculated using 2013 UK import shares and monthly average exchange rates. Normalised to 100 in January 2015. From a researcher’s point of view, the referendum and the resulting depreciation of sterling can be regarded as an exogenous macroeconomic shock that was sudden, strong and persistent. Our research is the first attempt to trace out the economic consequences of the referendum shock using detailed econometric analysis. Economic theory predicts that a strong and sustained depreciation of a country’s exchange rate should lead to an increase in inflation. In fact, CPI inflation in the United Kingdom rose from 0.4 percent in June 2016 to 2.6 percent in June 2017 and 3.0 percent in October 2017. But it could be that inflation rose over this period for reasons that are entirely unrelated to the referendum shock, for instance, a rise in the global price of oil and other commodities. In fact, inflation also increased in the US and the euro area after June 2016 as shown in Figure 2. It would, therefore, be wrong to attribute the entirety of the rise in inflation to the referendum shock. Source: Eurostat Harmonised Indices of Consumer Prices. Notes: All indices normalised to 100 in June 2016. We deal with this challenge in two ways. First, we compare the UK inflation experience to that in the euro area. Second, we use the fact that different types of goods depend to different degrees on foreign imports. For example, imports account for a large share of final consumer expenditure on clothing, footwear and furniture. By contrast, the cost of housing (rents), education, restaurants and hotels is not much influenced by the price of imports. So if the depreciation of the pound was responsible for the increase in UK inflation, we should observe larger increases for goods that are more dependent on imports. 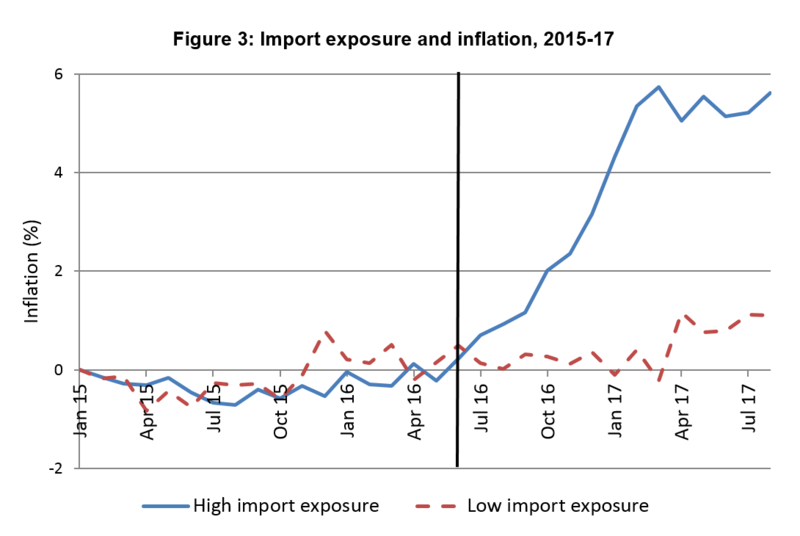 To measure import dependence we calculate the share of imports in consumer expenditure for different products, taking account of both final good imports and imported inputs used by UK producers. Figure 3 illustrates our main result. The inflation rate for goods that have a high import exposure shot up after the Brexit referendum (see the solid line). In contrast, inflation for low-exposure goods remained muted (see the dashed line). Source: CEP calculations. Notes: High import exposure set includes product groups with import shares above the sample median. Low import exposure set includes product groups with import shares below the sample median. Figure 3 shows the unweighted average inflation rate for each set expressed as the difference from the set average for January 2015. Econometric analysis confirms the pattern shown in Figure 3. Accounting for differences in product-specific inflation rates that are unrelated to Brexit (such as oil price movements and global inflationary pressures that also led to changes in inflation elsewhere), we find that product groups with higher import shares experienced significantly higher inflation following the referendum. 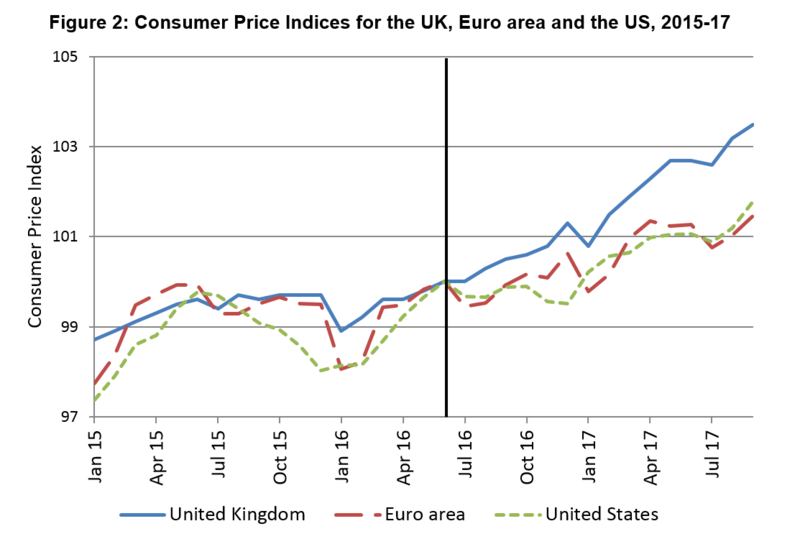 Our estimates imply the Brexit vote increased UK CPI inflation by 1.7 percentage points in the year following the referendum. It would be wise to view the precise magnitude of this effect with some caution, but it is clear that the effect is substantial. 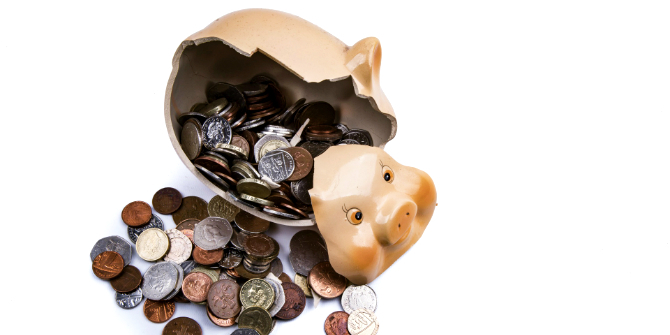 We next look at the impact of higher prices on household expenditure and living standards. We find that the average household has to spend £7.74 more per week, or £404 more per year, to afford the same purchases. By increasing prices without affecting nominal wage growth, the referendum has also reduced real wages, costing the average worker almost one week’s wages (4.4 working days’ wages, to be precise). It is clear that the average British household is already paying a price for voting to leave the EU. But not all households are equally affected. Households that buy a lot of imported goods have faced bigger price rises than households that mostly purchase products produced in the UK. This allows us to study the distributional consequences of the Brexit vote. We find that the inflation increase is shared evenly throughout the income distribution but not across regions. As Figure 4 illustrates, London is the least affected region with a rise in inflation 0.35 percentage points below the UK average. The increase is smaller for London primarily because Londoners spend relatively more on rent than the average household and rent has a very low import share. In general, the north of England is harder hit than the south. Scotland, Wales, and Northern Ireland are the worst affected areas. Our estimates imply inflation in Northern Ireland increased by 0.47 percentage points more than the UK average because of the Brexit vote. This is because households in Northern Ireland spend relatively more on food and drink, clothing and fuel, which are high import share products, and relatively less on rent and sewerage, which have low import shares. Source: CEP calculations. 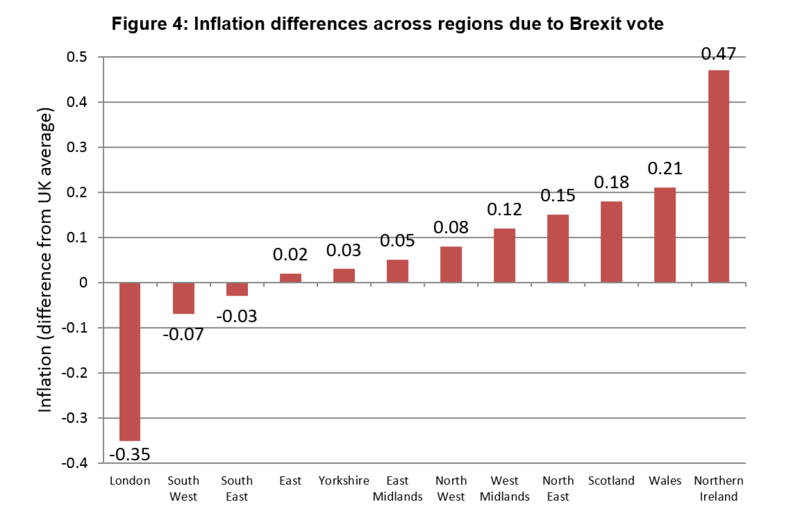 Notes: For each region, we show the estimated inflation increase due to the Brexit vote minus the average increase for the UK. See Breinlich et al. (2017b) for technical details. The economic effects of Brexit will depend crucially on the outcome of the ongoing negotiations between the UK and the European Union. But our results show that even before Brexit has actually taken place, the referendum shock of June 2016 has already had substantial economic costs. By triggering a sharp depreciation of the sterling exchange rate, the Leave vote has pushed up the costs of imported goods and hence inflation. Our results indicate that higher prices are costing the average household £404 per year. We find that these costs are shared evenly throughout the income distribution but not across regions. London is the least affected region while Scotland, Wales and Northern Ireland experienced the largest increases in consumer prices. 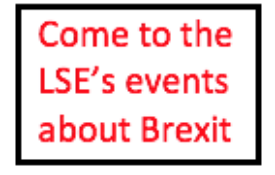 This post represents the views of the authors and not those of the Brexit blog, nor of the LSE. It is based on the LSE’s Centre for Economic Performance report The Brexit Vote, Inflation and UK Living Standards. Thomas Sampson, research leader, The UK in a Changing Europe and Assistant Professor at the London School of Economics and Political Science and Associate at CEP. Holger Breinlich, co-investigator, The UK in a Changing Europe and Professor of International Economics at The University of Nottingham. Professor Breinlich is also a Research Associate with CEP. Dennis Novy, co-investigator, The UK in a Changing Europe and Associate Professor of Economics at the University of Warwick. Dr Novy is also an Associate of CEP. Elsa Leromain, London School of Economics and Research Economist with the Trade Programme at CEP. Not included in this analysis are the benefits to the UK economy of a weaker currency. Namely increased competitiveness of exports and substitution of domestically produced goods for imports. Given the UK runs an unsustainable balance of trade deficit the long run sustainability of the pre-brexit vote exchange rate would have to be questioned. The demand boost from a weaker currency has already shown up in the record tourism numbers over the last 12 months. Inflation has increased but not dramatically. You are too young to remember the inflation of 22% of the 1970s. It may crease far faster later. Save the adjectives for then. And many of us would be happy to pay a lot more to rid ourselves of the utterly corrupt & evil organisation. I’m sick & tired of telling people what the EU is REALLY ABOUT. People must do their own research. … from this we can conclude that you’re retired, unemployed or childless.